Who says that Rabbis need to be dour sourpuss scholars without a sense of humor? Today, Rabbi Polirer focuses his energies on leading the prayers each Shabbat at Congregation Beth Hillel of Margate, and teaching B’nai Mitzvah from his home office in Parkland, bringing over 25 years of pulpit experience and pedagogical skill to his craft. A consummate teacher, he is still learning – a lifelong pursuit. His sermons are topical and scintillating – and always entertaining. His chants? Hear samples of his marvelous, velvet voice. Richard Polirer attended Crown Heights Yeshiva and the Yeshiva University High School for Boys in Brooklyn. After graduation in 1969, he took his Bachelor’s Degree in English and History at NYU (1972) and earned his Master’s Degree in History at Hofstra University (1974). He began to attend Seminary classes and received his Semicha (ordination) from Bais Midrash Tiferes Yisrael in Brooklyn, New York (1977). Rabbi Polirer has served a number of congregations in different professional capacities over the years. Starting in 1969, while still a college student, he was the Torah Reader (Ba’al Keriah) at Congregation Derech Emunah in Rockaway, New York (1969-72), and the Bell Park Jewish Center in Queens Village, New York (1972-73). While in Rabbinical School, he was Assistant to the Rabbi at the Rockwood Park Jewish Center in Howard Beach, New York (1974-1977), where he tutored 122 B’nai Mitzvah and functioned as the Ritual Director. During this time, he also studied Cantorial Arts under the personal tutelage of Cantor Bernard Beer, now-director of the Cantorial Training Institute at Yeshiva University. After being ordained, Rabbi Polirer was elected to the pulpit at Beth Israel Congregation in Fayetteville, North Carolina (1978-79). Moving up north to New Hampshire, Rabbi Polirer served Temple Israel in Manchester for the next 17 years (1979-96), relocating to Florida in the summer of 1996. Here, he assumed the pulpit of Congregation Kol Tikvah in Parkland (1996-1998) before taking on his present position at Beth Hillel. Outside his Temple role as mara d’atra, teacher of the community, Rabbi Polirer has taught as adjunct faculty at a number of secular and religious colleges, as well. A true Renaissance Man, teaching a wide range of subjects, from American and World History, to Economics, Geography, Social Sciences, Psychology, Learning Skills, Comparative Religion, Bible, Holocaust, and College English, the rabbi has provided students with quality scholarship and pedagogy at Southern New Hampshire University, Hesser College, and Notre Dame College. Since coming to Florida, he has discovered the challenging world of Elderhostel, and remains to this day a popular instructor in that realm. 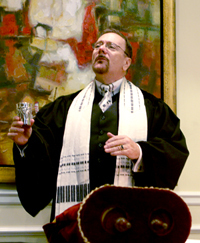 Today, Rabbi Polirer focuses his energies on teaching B’nai Mitzvah from his home office in Parkland, as well as performing Bar and Bat Mitzvah ceremonies in Miami & across South Florida, bringing over 25 years of pulpit experience and pedagogical skill to his craft. A consummate teacher, he is still learning – a lifelong pursuit. (If all this sounds formidable, don’t let it scare you away. After all, who ever said that a scholar has to be a stuffed shirt? Read About the Rabbi – A Tongue-in-Cheek Biography.